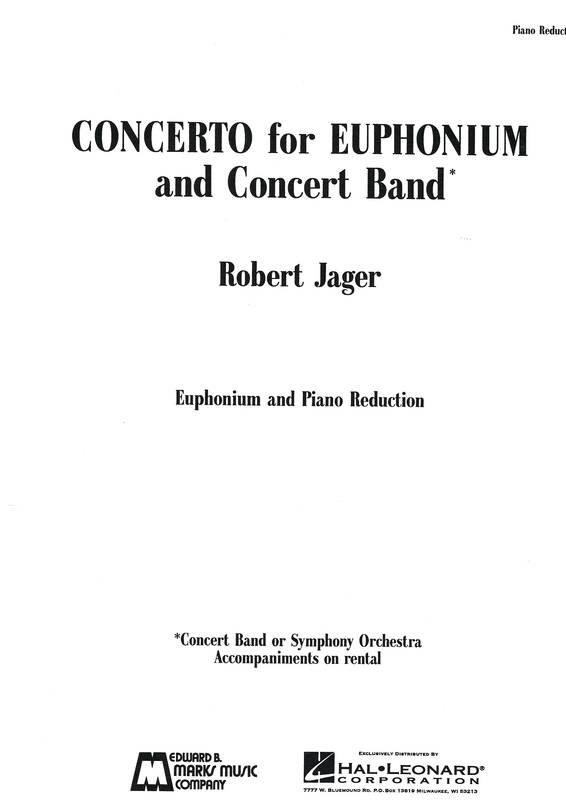 Robert Jager's Concerto for Euphonium was originally commissioned as a concerto for trombone and orchestra, But in 1996 the composer decided to rewrite and rescore the work as a concerto for euphonium with accompaniments for band, symphony orchestra and piano.The Concerto for Euphonium is a highly demanding work for both soloist and the accompaniment. The outer movements are filled with rhythmic and metric complexities that demand a virtuoso group of musicians is the second movement, while less technically demanding, requires mature musicianship because of its sensitive lines and shaded instrumental colours. 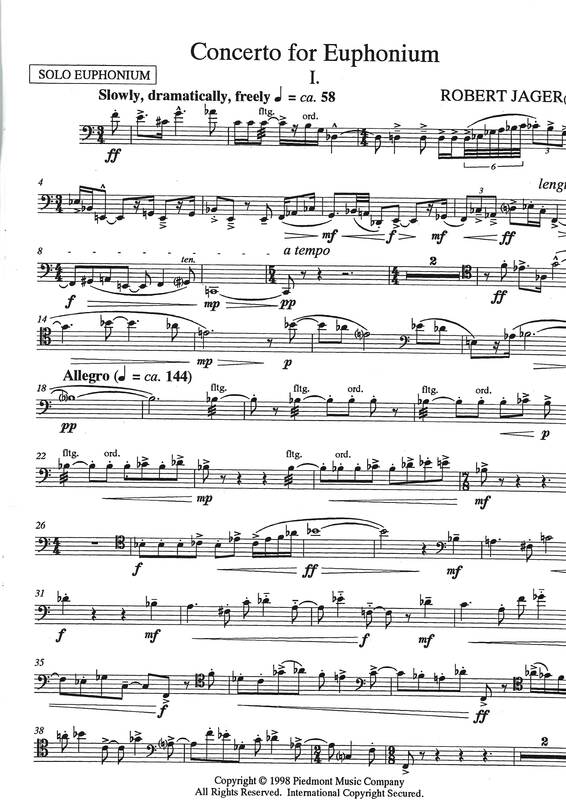 After a dramatic introduction dominated by euphonium the first movement moves into a highly rhythmic dialogue between soloist and accompaniment. The second movement is designed to be played at slowly and reflectively. It is this mood, one of reflection, that dominates the quasi-impressionistic character of the music. The third movement returns to the fiery rhythmic character of the first movement but this time more emphasis is placed upon mixed and is symmetrical metres so that the solid feel of the barline is lost.The form of this movement is that of a Rondo, and in the typical capricious mood of the Rondo literally rushes headlong into an exciting and brilliant finale. Written in three movements: Slowly, Dramatically, Freely; Slowly, Reflectively; Brightly, but Forcefully. 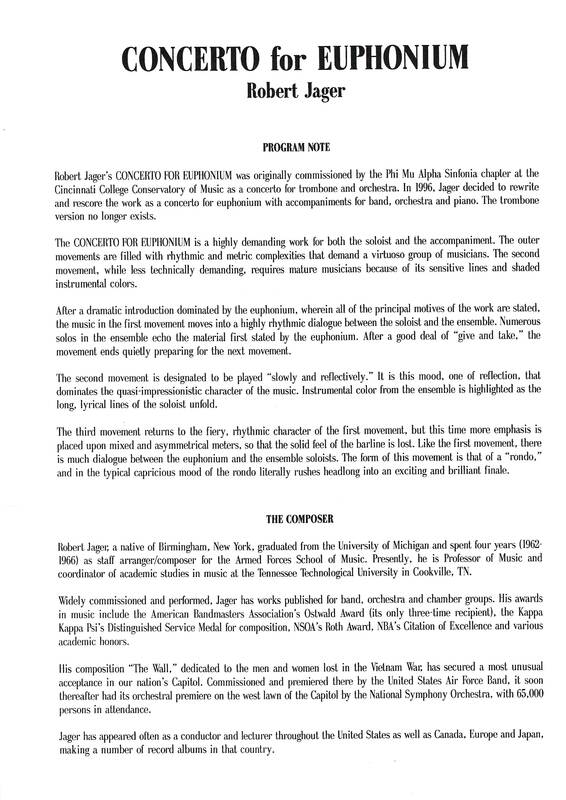 This challenging work features high intensity writing that translates to complex rhythms and syncopations. Flutter tonguing, lip trills, double tonguing, rapid meter changes, awkward trills and sections in seven flats encapsulate most of the difficulties of the work. Yet, its vigor and drive, especially in the third movement, can compensate the performer and listener for these challenges. The second movement has some nice recitative sections with ornamental runs. A strong addition to the more contemporary repertoire of the euphonium. This work deserves to be more widely used in recitals, concerts and competitions!